No, this is not a “how-to” as to be honest i have NO idea how to de-clutter. My friends actually HATE my room, and always have something to say about it. it is awful. 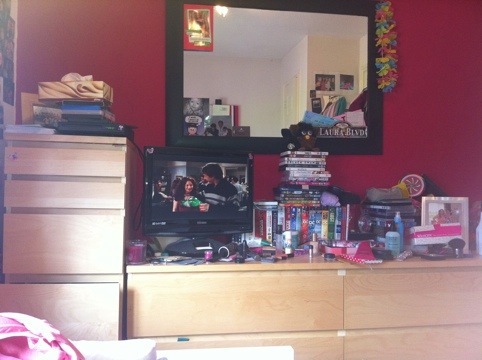 i cannot see the top of drawers because of all the make up and DVDs and clutter on it. the dvds are there mainly because i have FAR too many and not enough space in my DVD drawer. 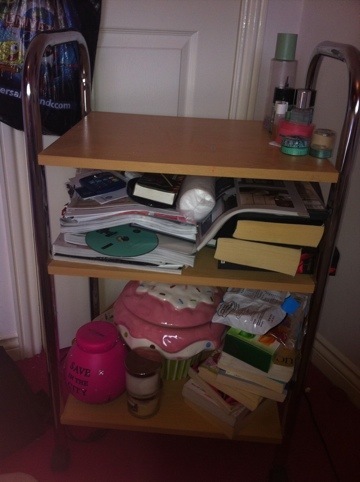 I am also a hoarder…look at my mirror. i keep tickets, invitations, labels off clothes, pictures, cards and even a coaster! the tall drawers on the left? full of CRAP. well maybe not ALL crap, but the second drawer and the bottom drawer are full of nothing. completely useless nothingness. this is a complete waste of space and i always feel (and my mum always points out) that i need it. the books (which i have just got from Linda, who was cleaning out her cupboard for moving) will just be going back to the cupboard in that room when i move next door. the cupcake will be going somewhere else and so will the terramundy. All the magazines will be added to my pile of Elle mags in the corner (which icant get into because theres things on top of them – NO ROOM!). and my laptop usually sits at the top. if i find ANY good website that ha good tips on organisation and the such, i’ll share. but for now, i’ll deal with my mess and clutter and everyone else will have to.